This course was held at Milton Mill, a beautiful house belonging to Hugo’s stepmother with an array of gardens, a river and pond. 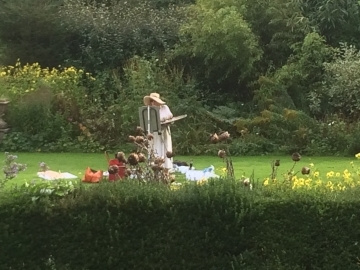 The students enjoyed painting en plein air in the varied landscapes of the gardens, and at the seaside in West Bay. Each day began with Hugo giving a talk about the paintings of the Masters, encouraging the students to relate to the images in new ways. Outside the group experimented with using colour as a way to express their response to the landscape, distilling the morning’s talks into their experience. The supportive and collaborative nature of the environment provided a fertile ground for the students to explore Hugo’s teaching, and the wonderfully fresh lunches provided sustenance! Hugo is looking forward to teaching another course here in the summer of 2019. 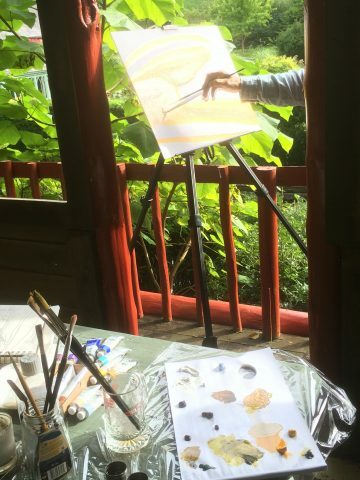 This course was held at Berghersh Place, a delightful country house with beautiful gardens and a newly built art studio. 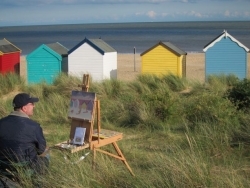 The students enjoyed painting en plein air in the surrounding Suffolk countryside, in and around the gardens and by the sea at Felixstowe Ferry. 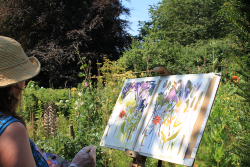 During this course, Hugo encouraged the students to explore the role of colour in expressing their different feelings and responses to the landscape surrounding them, and to evolve their relationship to the medium of paint. The huge skies and inimitable light of Suffolk provided plenty of inspiration for their sojourns into the worlds of colour, light and form. As the “Gardens” exhibition at the RA demonstrated, a painting is concerned only superficially with its subject, but much more profoundly with ideas about light, colour, space, shape and design. This is not to say that the artist is unmoved by, or disengaged with, the subject, but simply that through exploring the abstract qualities mentioned above a much deeper resonance is revealed. In the hands of a good painter, a landscape painting can evoke many mysteries, be they spiritual or earthy, intimate or expansive, triumphant or melancholic. found their own voice in expressing their ideas. 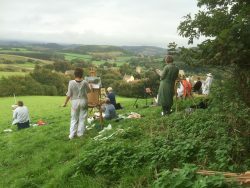 Situated on the Symondsbury estate in Bridport, Dorset, students painted en plein air in the surrounding countryside, as well as in the beautiful 15th Century Tithe Barn. 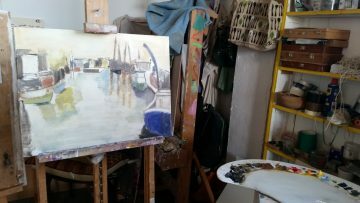 In this course at Hugo’s Bristol studio, students concentrated on finding ways to connect with our imagination, so that their work may become more intense, more personal, more liberated, and that the marks they made on the canvas begin to express what they feel. In order to achieve they deconstructed the process of painting, by pulling apart its individual components, engaging with their subconscious, and stepping out of their normal working practice and setting aside preconceptions. During the week students looked at a number of inspirational artists whose work was the fruit of a rich inner life and who expressed both their thoughts and their feelings in the language of paint. On this course students explored the different approaches of some of Modernism’s Greatest Masters, considering how the shape of a still life, interior or landscape can act as an anchor for a passage of visual poetry. ‘Making Your Mark’ re-energised and focused their painting practice and helped them to evolve as a painter with a distinctive voice.